The night before my parents arrive, I almost do not go out for dinner. At midday I send the email I dread sending but that seems to be required regardless, at regular intervals: hello, I am a little mad today and may be unable to participate in our scheduled social interaction. Those emails don’t really get easier to write. Every time it is a disappointment. It means I tend not to commit to seeing people, because I would rather avoid the shame and stress of pulling out, admitting in front of friends that yes, I am still mad, I am not better yet and I may never be, even though I do what I do and I seem so terribly together and efficient, and so on. It is still galling. There is still shame. I still hate letting people down. So I send the email just in case, because cancelling six hours ahead is better than one, if I don’t improve. In the end I go out, but not before a minor emotional meltdown in the street after I leave the office. Grant holds my shoulders and reassures me the world is not an awful place. I take a deep breath or three and board a train and then I am committed, and in the end it is an excellent evening and I am not too mad after all. I am up to my waist in sea water and Grant is standing in front of me, holding my shoulders, reminding me that the world is not an awful place. We can see the beach from the villa we have taken for a week just north of Cairns, just past Deadman’s Gully nature reserve, past the signs that warn of crocodiles and the pole full of vinegar in case of marine stingers. There is a white-bounded net that bobs up and down on the water and, in theory, keeps out the monsters that might twine tentacles around your legs and hurt you. The water is thick with sand and I cannot see my feet below the surface. Grant is in front of me and I take one step at a time, deeper into the water. Eddies swirl around my knees. The panic hits me in waves. Thick clotting brain-scrambling panic, the sort that makes you strike out for shore and say cruel things to make the fear end, followed by lulls of maybe-time. Waves of no — no — no — I cannot, then it eases into a chorus of well — perhaps. I can imagine myself leaving the house. I can picture myself dressed, opening a door. If I can imagine that much perhaps — perhaps I can be a normal human being for a night. I can imagine myself swimming in this warm, cloudy water under such astonishing sky. I can. The lull occurs. I say: “Follow me. Now. Before I change my mind.” And I turn towards the far edge of the net and I swim. Powered by panic and perseverance I kick harder and faster than he can keep up with, and I make it out to the net, a monstrous thing that catches at my legs but that I am expecting and so do not scream about. I turn and I make for shore as the panic begins to rise again, catching a wave and putting my legs under myself and striding out of the sea. The water off Green Island is clear blue and warm in the morning. 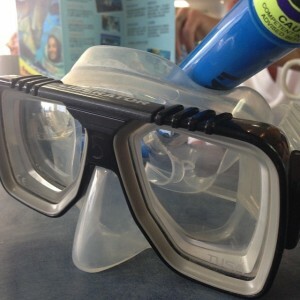 It takes me a few tries to successfully breathe through the snorkel, as I keep holding my breath and expecting to drown. Then I manage, eventually, to duck down and hold myself steady, kicking slowly and gliding through water clear as air, parting a shoal of fish the size of my palm that kick alongside me out to the deeper water. Grant calls me over and shows me a hermit crab, scuttling along the bottom; there are big broad fish in ones and twos. I am thinking: this is pretty awesome, all these fish right here. Then we go deeper, out to one of the dark patches that litter the sea floor. First it is seaweed and a few scattered fish, then suddenly it is like flying over a forest. There are more fish than I can see in one go. I have to compartmentalise, looking first at things on one side and then on the other, else I will miss something. Yellow and black, orange and blue. An electric blue starfish the size of my arm. Beneath it all, the coral: branches and balls, limestone structures built for monsters to live in. When we swim to shore Grant chases a manta ray between the waves. In the afternoon, though, the water is deeper. Colder. Currents rush across our bodies, eddy around my knees. A raft of seaweed floats on top of the waves, which are bigger now, clouding the water and making it harder to see. I get frightened. I stop trusting my body to carry me and I stop trusting the sea. Soon I am struggling with my snorkel, because hyperventilating through a tube underwater is even more problematic than doing it on dry land. I make it out to the coral but I am scared of the seaweed clinging to me and dragging at my skin. I try but I do not succeed in seeing much else of wonder; I am too afraid. Grant holds my shoulders and I cling to him in the water, scared of moving, scared of not moving, willing myself suddenly to become able to teleport or levitate or simply not feel this ridiculous rushing chaotic gut-wrenching panic any more. Eventually I am just saying the word “phobia” over and over into my snorkel as though by naming it I will be able to make it stop. We decide to swim back for shore. And then there it is. I duck my head under the waves and there it is: a turtle the size of Grant’s torso, perhaps a metre below me, sculling one fin at a time out to sea. I make the sort of strangled yelping noise that generally denotes drowning but manage to signal to Grant that, no, I’m OK, but look: turtle. TURTLE. Through a snorkel, I explain. And we turn tail together and, holding each other in sight, we follow the turtle. We swim back out into deep water, through the mass of surface seaweed I could not break before. I am terrified, but the turtle is more important. We follow and follow until looming out of the dark water beneath there is another turtle, treading water, patiently waiting, and the two of them together slowly, gracefully paddle their way out to sea.